The Super Bowl is coming, and here are The BEST Slow Cooker Barbecued Beef Sandwiches with homemade sauce! Sandwiches like this are perfect for a game-day food, and using the slow cooker frees up the cook to watch the game! 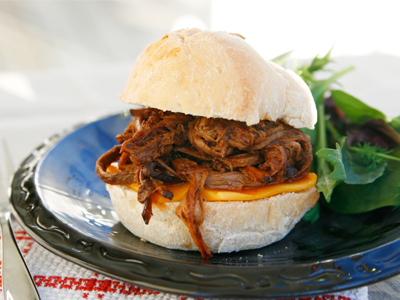 Or make Slow Cooker Barbecued Beef Sandwiches for an easy dinner any time of year. Click here to PIN this tasty collection of slow cooker barbecued beef sandwiches! There are certain recipes that are slow cooker classics, and definitely slow cooker pulled beef or pulled pork with barbecue sauce are things people make over and over in their slow cooker. There are plenty of recipes for barbecued beef sandwiches that just use a jar of barbecue sauce, and no judgement from me if you do that. But I think cooking the beef in homemade barbecue sauce takes it to a whole different level in the flavor department. 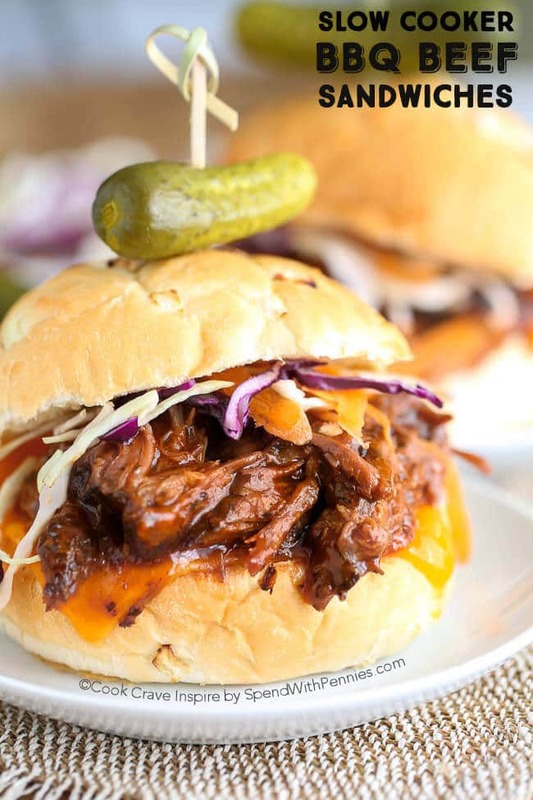 And slow cooker barbecued beef sandwiches are a perfect easy dish to serve for parties so I’m reminding you about this collection of The BEST Slow Cooker Barbecued Beef Sandwiches with Homemade Sauce in case you want to add this idea to your Super Bowl Party menu! Each of these recipes is slightly different, and I hope you’ll find one that might become your new favorite recipe for Barbecued Beef Sandwiches! All photos are copyrighted to the blog that posted the recipe; just click on the name for each sandwich to see the full recipe on the blog that posted it. 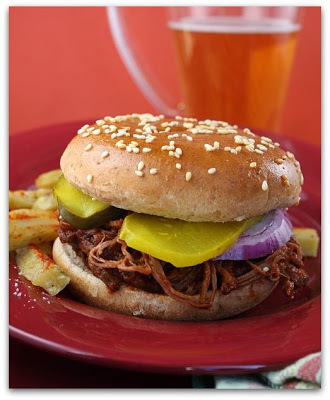 Let’s start with the Barbecued Beef Sandwiches pictured above that Lori from Recipe Girl found in a Weight-Watcher’s publication and featured on Culinary Covers. The recipe starts with flank steak rubbed with brown sugar and black pepper and then cooked all day in a homemade barbecue sauce mixture and Lori says it’s the kind of recipe your family will be asking you to make. Jamie from My Baking Addiction calls this Superbowl Barbecued Beef, and I agree these beef sandwiches would probably be a hit at any kind of gathering. 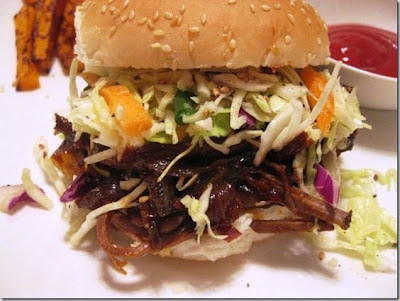 Jamie starts with chuck roast which simmers in homemade barbecue sauce ingredients; then the meat is piled onto mini buns and served with sweet slaw. 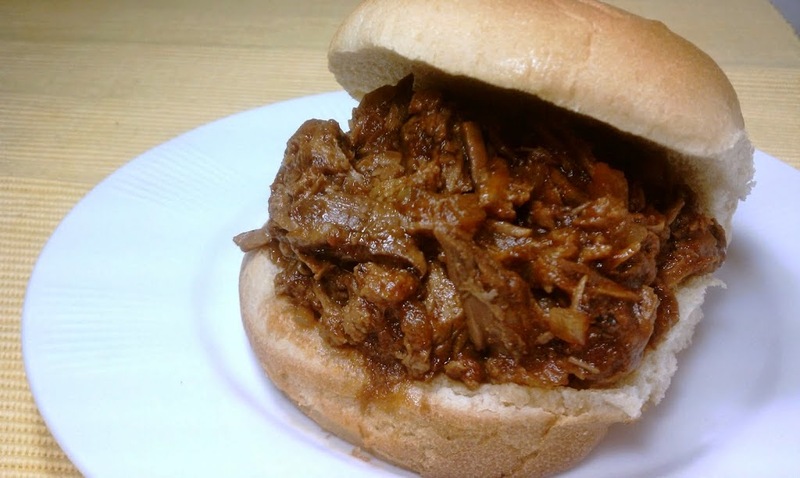 Slow Cooker Barbecue Beef Sandwiches from Spend with Pennies have a touch of chili sauce in the tasty barbecue sauce! It took Lydia a few tries to perfect this Slow Cooker Barbecue Beef Brisket from The Perfect Pantry, and I love the techniques she uses to get the barbecue-like quality. 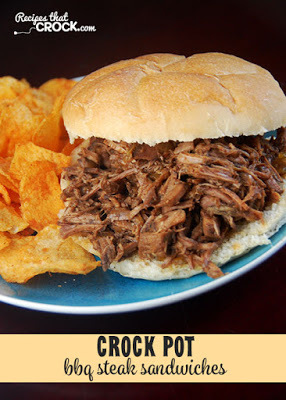 Crock Pot BBQ Steak Sandwiches from Recipes that Crock start with round steak, and this homemade sauce uses all the traditional seasonings for barbecue sauce! 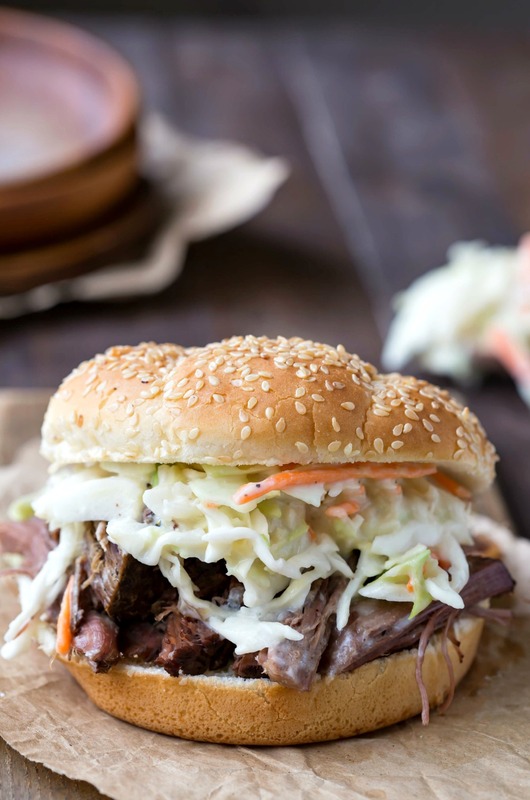 The Spicy BBQ Brisket with Healthy Asian Slaw from Danica’s Daily features meat with a spicy touch due to the addition of sweet jalapeno or chile sauce in the barbecue sauce mixture. I love everything about this recipe, including the healthy slaw with Asian flavors. 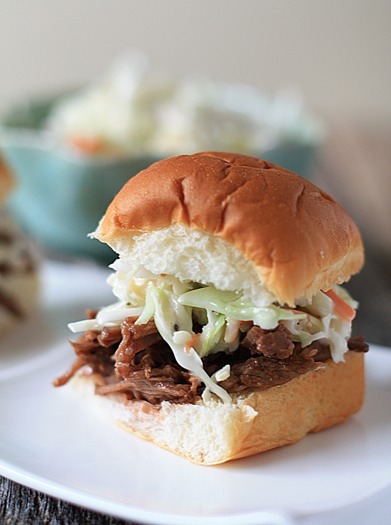 Slow Cooker Beef Sandwiches with Horseradish Coleslaw also have a touch of horseradish in the barbecue sauce. Slow Cooker Sweet and Smoky Beef from the Perfect Pantry has a sauce with Chipotle Peppers for a slightly different take on barbecue! The CrockPot Barbecued Beef from Color Me Pink features a delicious-sounding barbecue sauce that begins with sauteed onions and garlic, then adds chile powder, brown sugar, and molasses and finishes with canned tomatoes and cider vinegar. 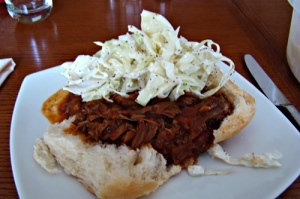 Christine also tops her Barbecued Beef Sandwiches with a scoop of coleslaw. This Smoky Slow Cooker Beef Brisket from Sarah’s Cucina Bella uses tomato paste, molasses, Liquid Smoke, and Honey to make a delicious-sounding smoky barbecue sauce that sounds like it’s just slightly sweet. Sarah likes to serve this on sandwich buns with a slice of cheddar cheese, but she says the meat is also good for nachos and wraps. 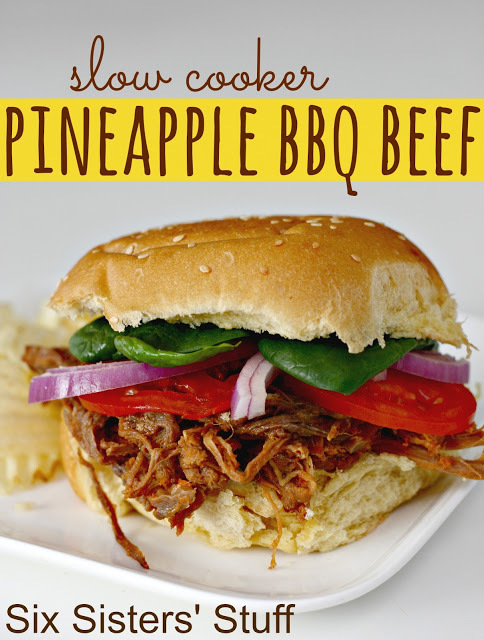 Pineapple fans will love this Slow Cooker Pineapple BBQ Beef from Six Sisters’ Stuff, and this uses ingredients you probably have in the pantry. 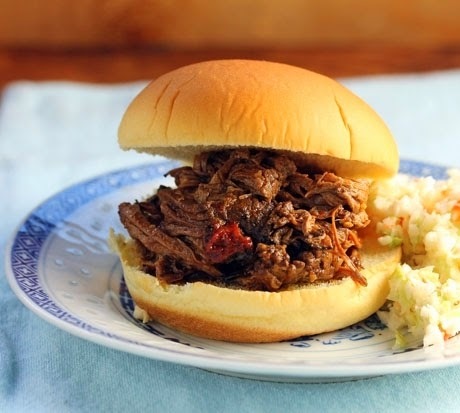 And finally, this Slow Cooker Barbecue Beef recipe from Emily Bites came from Emily’s mom, who got it from her own mom! Check out The Best Slow Cooker Beef Tacos from Food Bloggers! 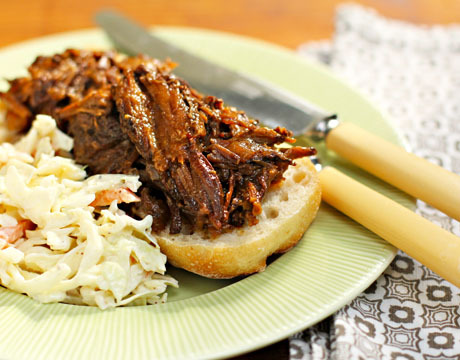 Does your family like Slow Cooker Barbecued Beef? Let us know in the comments about what ingredients are a hit when you make this slow cooker classic. Thanks for including my recipe, Kalyn! Great roundup. Now that fall is nearing, I am looking forward to making pulled pork (and it's fun cousin brisket) again. Thanks Sarah, and my pleasure including your recipe! This round-up is making me hungry. Thanks for the include! The others look wonderful, there's nothing like a great sandwich. And here I thought I was the only one who loves the combination of barbecued beef and cole slaw on a sandwich! Great round-up. Lydia, it's obviously a popular combination. Thanks Kalyn for featuring my recipe and giving me so many more I NEED to try 🙂 I love using my slow cooker year round…even in the summer since it does not heat up the house.